Fall is around the corner and so thoughts turn into cozier, furrier things. 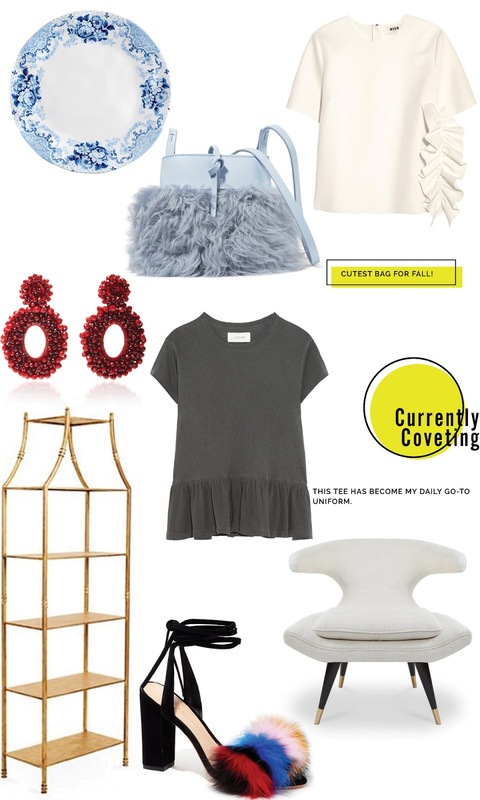 Here is a list of all the faves I'm currently coveting. And there is one item on the list that I already own and it is on heavy rotation....I have been known to wear it a couple of days in a row even because I love it so much. Can you guess which? Blue and White Plate || I don't love melamine plates but these are an exception. The beautiful blue and white classic pattern would make these a treat for patio or pool gatherings. Plus, imagine these in a table setting with a pink flower fcenterpiece! Pretty, pretty! And they are only $39 for a set of four. White Top || You know me and ruffles. This chic white top is so versatile. Wear it with a skirt or slacks for an easy evening look or wear them down with jeans or shorts. Either way the feminine ruffles will make you stand out. Light Blue Fur Bag || What a little gem! This cute little bag comes in this most delicious sky blue. What a fun accent to add to your fall ensembles. Red Earrings || These are bold and fabulous. They come in an assortment of colors. It was hard to choose which ones I should share with you. Blame the fall season fast approaching, but I have this elegant dark red color in mind lately. Grey T-Shirt || It doesn't get better than this tee! I love, love mine and seriously wish I had it in every color. It is so comfortable, soft and easy to wear. I have even worn it for a dinner party with a cute black skirt. It's a buy that pays for itself (well almost!). Gold Etagere || This antiqued gold beauty that stands at 6 feet tall is only $599. I love the shape and size and it's timeless appeal. Imagine how fun it would be to style it. I can picture getting two and using them to flank a fireplace or a bed. #Obsessed. Furry Heels || These are so yummy! And they have that perfect sized heel that makes them easy to wear. It would be as if you were wearing your slippers out for a night in the town! I could see myself wearing these all winter long (in a light Dallas winter that is!). Accent Chair || The beautiful shape of this chair has me swooning. It's simple lines and chic fabric make it stand out. What are you currently coveting lately?